enjoy the freedom to live independently – and with no monthly fees! 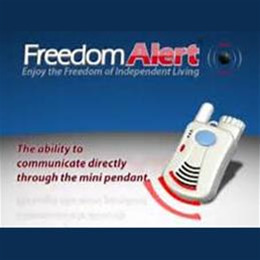 FreedomAlert is the world’s first programmable two-way voice pendant communicator with no monthly fees. Personal security has never been so small or affordable. The FreedomAlert can be programmed to call family, friends, or neighbors, at anytime from anywhere in the home and into the surrounding yard. If the programmed contacts are unreachable – the system can default to call an emergency 911 operator. The FreedomAlert has the ability to be programmed with up to four (4) contacts to call anytime. The system can be customized with the three position switch on the back of the base unit to select one of three modes. A power outlet and an active landline are all that is needed for the unit to operate. The medical pendant is powered by a lithium-ion battery that lasts up to 6 months on a single charge.